From Lower to High School, we encourage all of our students to get involved with programs that nurture a passion for scholarly and interest-based activities. In addition to augmenting a robust scholarship application, our clubs bolster student camaraderie and Walden community involvement. Each club is sponsored by at least one faculty or Walden parent who facilitates club competitions, meetings and activities. Read more below about the variety of clubs offered in each school division! Sign up with your email address to receive news and updates about clubs in the Walden Newsletter! Learning to play chess has the benefits of increasing your child’s perception and their ability to concentrate. Chess can also be an integral and valuable aid to a child’s analytical and conceptual development, in addition to being a very enjoyable sport! Discover all things Chinese with the Lower School Chinese Club hosted by Walden's very own Durham Family! Club participants will learn about Chinese Zodiacs, songs, stories, characters, painting, crafts, games, the use of chopsticks and the four tones for speaking Chinese. Science Club is an opportunity for older Walden students to mentor younger students with hands-on science activities under the watchful eye of Mr. Webb. K-Kids is a service club sponsored by Kiwanis International of St. Matthews. K-Kids is for any student in fourth grade. K-Kids meets once a month during the school day in Mrs. Green's classroom. There is at least two outside of school events. The club raises money to purchase books for Kosair Children's Hospital and to purchase items for Wayside Christian Mission during the December holidays. Quick Recall begins the first Friday of December and is open to the 4th and 5th grade. Students will be exposed to a variety of materials and will practice recalling facts along with learning sportsmanship and teamwork. Builders Club is a service organization, for middle school students (grades 5-8), sponsored by the St. Mathews chapter of Kiwanis International. The club meets on Fridays during lunch about twice per month. The club participates in We Day, by sponsoring at least one local and one global service project annually. Please contact Mrs. Kunz or Ms. Sapoznik (faculty sponsors) for more information. An invitation to join this club will be announced during assembly in September. Learning to play chess has the benefits of increasing your child’s perception and their ability to concentrate. Chess can also be an integral and valuable aid to a child’s analytical and conceptual development, as well being a very enjoyable sport. FIRST LEGO League (FLL) is an international competition organized for elementary and middle school students. Each year in August, FIRST LEGO League introduces a scientific and real-world challenge for teams to focus and research on. Walden participates in one or more competitions throughout the year. MATHCOUNTS provides engaging math programs to US middle school students of all ability levels to build confidence and improve attitudes about math and problem solving. Opportunities for competitions, enrichment programs, and contests make this club ideal for both students wanting to be challenged in mathematics and those who are eager to improve their skills! Math Monsters is a meeting of math-minded middle-school students. Students in grades 5-6 gather in room 16 on scheduled Wednesdays from 3:00-4:00 to get help with homework, have a snack, and play games! The first half hour is devoted to homework help or quiz prep, and at 3:30, the games begin! There is no "sign-up" and this is a free activity. Middle School KUNA (Kentucky United Nations Assembly) is offered for students interested in international issues and cultures. This club is open to students in the 6-8th grades with meetings held generally during lunch on a weekly basis. The club is part of the Kentucky YMCA Youth Association. A statewide conference is held every spring where students select a United Nations member country and represent the country at the conference. NJHS is an honor society which recognizes students for academic achievement, and promotes leadership, citizenship and service. Members are chosen in the spring for membership in 7th and 8th grade based on earning a GPA of 4.0. The club promotes scholarship, leadership, service, citizenship, and character. The club meets once a month and sponsors 1 major fundraiser and community service project a year. Joining the pep band is a great way to show your team support and great way to bond with other students who enjoy making music. Pep band members learn how to play fun charts like “Go Big Blue,” “Louie, Louie,” “Smoke on the Water,” and other neat tunes that aren’t covered as a part of the curricular band. Quick Recall is an academic team for students in 6th-8th grades. It is similar to Jeopardy, except you play on a team! We compete against other schools in the area through the Kentucky Association for Academic Competition. Practices will start in mid to late September, and the team will meet Wednesday mornings at 7:00 AM through the middle of January. We will participate in the KAAC District competition in mid-January, and then move on to the Regional competition if we qualify. More information about the club will be posted in the newsletter in September. Please contact Mr. Cochran if you have any questions. Speech and debate is an academic activity available to students in middle and high school. Similar to athletic sports, speech and debate activities are challenging, competitive in nature, and require regular practice, coaching, dedication, and hard work. Featuring a range of public speaking categories, speech and debate has something to offer every student! The Walden Academic Team is a group that is for all students interested in competitions such as Quiz Bowl and Governor’s Cup. Be Strong is a national non-profit organization focused on preventing bullying. Be Strong uses a comprehensive student-led approach to: encourage ALL students to reveal challenges they are facing, train and equip students to become more resilient, arm them with access to local services and organizations that can help, and unite them to change their families, schools, communities, states, and country. The perfect club for students who love traditional games, puzzles, video, and handheld games. This hobby club strengthens student socialization and interest in modern game development and strategy. The Drama Club is a new club that focuses on the craftsmanship and appreciation of theatrical performance. It’s a great club for those high schoolers interested in participating in the K-12 musical. Walden's Environmental Club brings together environmentally minded students that have a passion for bettering our community. Their main activity is running Walden's recycling program. Each year these student's push Walden to be more environmentally conscious and to lessen our impact on the earth. Walden’s Girl Up chapter engages students to stand up for girls, empower each other and change our world by becoming advocates and agents of progress. Girl Up is a campaign partnered with the United Nations to support its programs in several developing countries to give girls an equal chance for education, health, social and economic opportunities, and a life free from violence. Key Club is a service organization, for high school students (grades 9-12), sponsored by the St. Matthew's chapter of Kiwanis International. The club meets on Fridays during lunch about once per month. The club participates in We Day, by sponsoring at least one local and one global service project annually. Please contact Mrs. Locke (faculty sponsor) for more information. Mrs. Elder and Mr. McLean will be assisting as needed with activities and field trips. An invitation to join this club will be announced during assembly in September. The Kentucky United Nations Assembly (KUNA) is a 3-day experiential learning conference in which students participate directly in simulated international diplomacy. The big difference between high school KUNA and middle school KUNA is that the high school club is very student driven. KUNA offers students the opportunity to experience the richness of cultures from around the world, develop empathy, and hone their critical thinking skills while engaging with a wide variety of perspectives and global issues. The Kentucky Youth Assembly (KYA) is a 3-day experiential learning conference in which students serve as part of a model state government. KYA offers students the opportunity to learn about a wide variety of issues, develop critical thinking skills, and articulate their beliefs while engaging constructively with their peers from around the Commonwealth. A great deal of preparation will take place in Mr. Kincade's Government class though attendance to the actual conference itself will not be mandatory. Kiva is a non-profit organization with a mission to connect people through lending to alleviate poverty. Leveraging the internet and a worldwide network of micro-finance institutions, Kiva lets individuals or groups lend as little as $25 to help create opportunity around the world. The Walden LGBTQ+ Club advocates and raises awareness of LGBTQ issues, both regional and global; it seeks to empower the solidarity between the LGBTQ community and Allies. 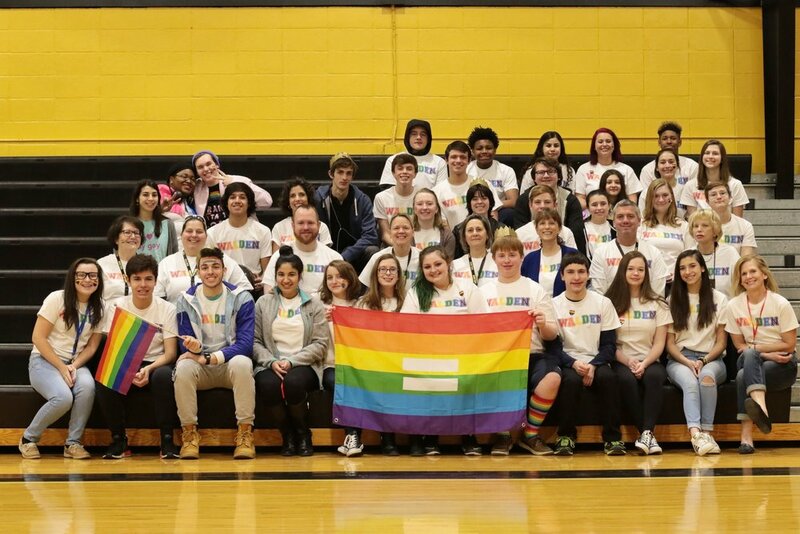 Walden Pride Day includes guest speakers, humanitarian fundraising and the celebration of acceptance, respect and community inclusion for all. Spanish Club is a gathering of students interested in learning and celebrating the Hispanic cultures. The students seek to experience and learn about food, music, dance, art, and traditions from various Hispanic countries in our world while they practice the language and develop leadership and teamwork. Spanish National Honor Society is an international academic honor society focused on Spanish language excellence in secondary education and promotes a continuity of interest in Spanish studies. Its motto is "¡Todos a una!" (All Together for One Goal). Walden's chapter is named "La Catrina", after a Mexican folklore character. Students who join the Quick Recall team represent Walden at competitive events, most notably being the Governor’s Cup. Governor’s Cup has become the state’s premier academic event, involving over 20,000 students, nearly 1200 schools, and thousands of coaches, administrators, parents and community leaders who see the rewards gained from encouraging academic performance through properly structured and professionally administered academic competition. High Schoolers may advance to the District, State, and Regional competitions. Walden Student Council represents student interests, acts as the liaison to the administration of the School, and organizes high school activities and events. WSC is made up of twelve students elected by their peers: Student Body President, Student Body Vice-President, Student Body Treasurer, Student Body Secretary and two representatives from each class. The staff of the Writing Club are given the opportunity to focus on creative and academic writing, honing their skills for classroom projects and the final project at the end of year: the Walden literary book, Wild and Free. Every year, Writing Club members submit their own writings and collect other students’ creative work (including writing and artwork). High Schoolers assemble for meditative yoga sessions instructed by Mrs. Sharon Weis. The benefits of yoga are innumerable, promoting meditative introspection and physical health. Namaste.